I love coffee. Love, love, love it. To know me is to know I love coffee. The words ‘coffee lover’ will be written in my eulogy. I am defined by my love of coffee. See what i mean…I am little obsessed. When my son was 3, we would go through the Starbucks drive thru and he would be able to say my order…”one tall bold cup with 2 splendas and half and half”. yep, I have apparently brainwashed my kids. Oops! There is just something about that warm mug full of that precious brown liquid in your hands. When I see someone with a cup of coffee in the carpool line or on TV, I admit I feel a little jealous. I was watching Pioneer Woman on Food Network the other day and in this episode she makes iced coffee. I was intrigued. 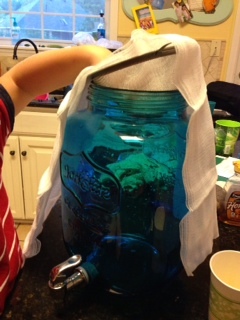 Not so much with the fact that she was making iced coffee, but more intrigued with HOW she was making it. She mentions in the episode that iced coffee tends to be watered down when you make it yourself and how her method changes that. So I figured in the interest of my blog, in the interest of those who might like iced coffee and want a foolproof method…I would give it a go. For all of you. For research. Just so we are clear. Ha Ha!! I really didn’t have high hopes, but I was amazed. The stuff is awesome. I am sitting here as I type with a lovely tumbler of iced cold coffee and I am not missing my warm mug much at all. 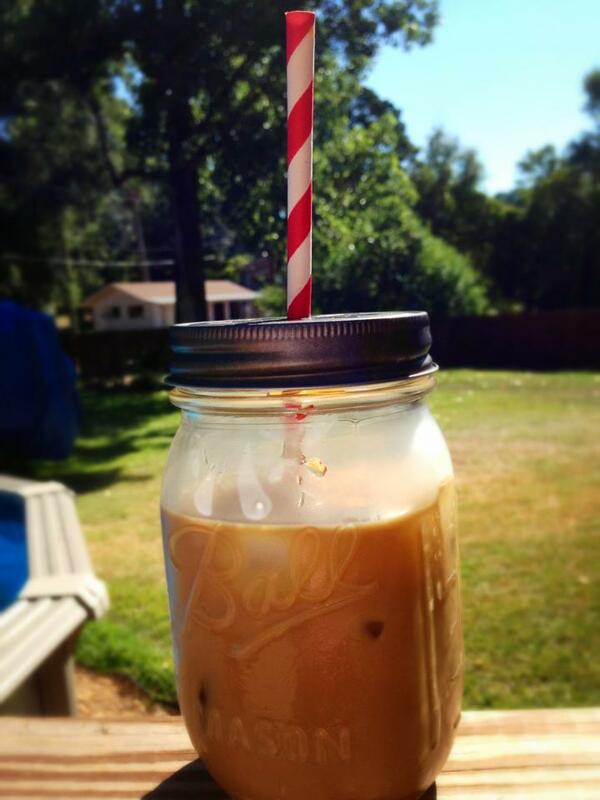 So if you love coffee, especially if you love iced coffee, you should give her recipe a whirl. Excuse my little helper’s hand in the picture…I needed some backup. Lay some cheesecloth in a fine mesh strainer. Slowly pour the coffee mixture through the strainer and into a clean container. After you have poured most of the liquid out, gently press the grounds with a spoon to make sure you get all of that lovely coffee out and then discard the cheesecloth with the grounds inside. I will forewarn you, this is messy. 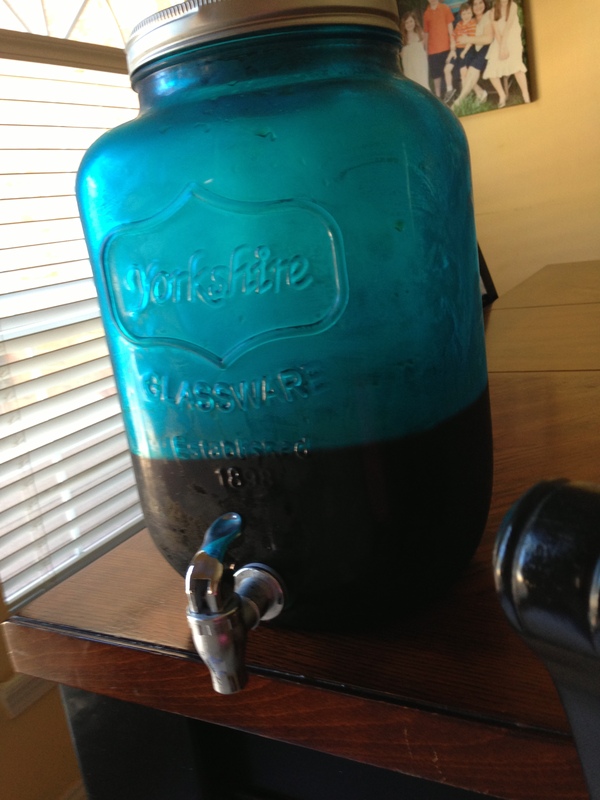 We used the leftover grounds in our garden…just FYI. Chill your pitcher of coffee in the fridge. Pour the coffee into a glass filled with ice. Add your sweetened condensed milk or sugar or sweetener and then give it a quick stir. Prepare yourself for iced coffee nirvana. To fall in love with iced coffee. To be a changed person. Ahhh!!! That picture just makes me happy. I can relate perfectly! I’ve been told I should just run an IV from the pot to my arm!! !